This whiteboard is easy to use and maintain, perfect for all kinds of offices, home studios and even sporting areas for use as a tactical board. Whiteboards have quite quickly become the preferred form of displaying information during meetings, brainstorming sessions and a way of documenting information during a meeting, lecture or lesson for all participants to see. We have a a wide variety of these available at a reduced price to suit your budget. 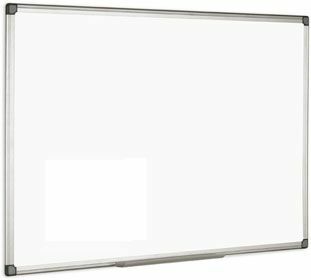 These economical whiteboards have an Aluminium frame and are very easy to mount to any wall surface. These whiteboards can be used landscape or portrait depending on your preference and the normal lead time is 2-3 days from order. These whiteboards are delivered completely free of charge to any UK mainland address.